Swami Muktananda, Play of Consciousness (South Fallsburg, NY: SYDA Foundation, 2000) p. 165. 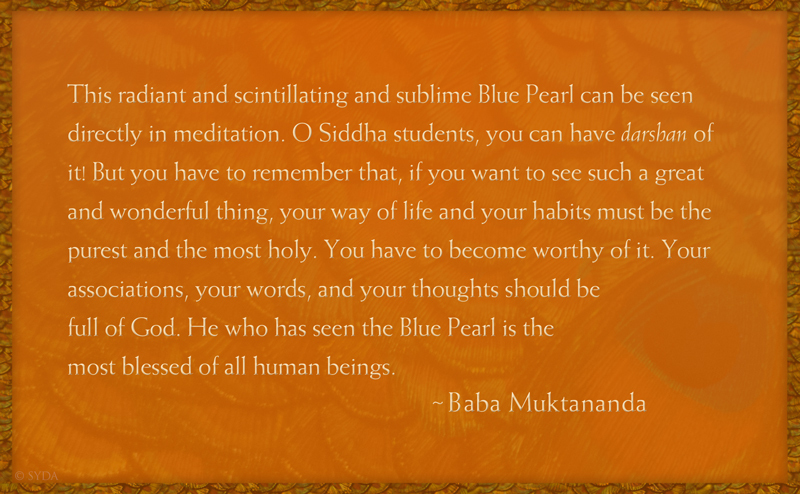 As I contemplate Baba’s teaching, I understand that infinite consciousness manifests in the form of a tiny Blue Pearl. Thanks to the powerful flow of grace from Baba's lineage, light one day entered through the crown of my head straight into the center of my heart, where the Guru resides. My mind stopped and flooded with silence, as I perceived a faint blue light. When I tried to visualize the Blue Pearl, the blue light disappeared. I understood that the Blue Pearl cannot be conceptualized, since the mind has to cease all thoughts to perceive it. I am very happy and deeply touched to read Baba’s words addressing the importance of a pure life. This teaching reminds me that every part of my world should be filled with purity. So many times during the day I remind myself "not this, not this!" when I find that I am thinking something that is not uplifting, or when I let any of the multiple worldly distractions take me out of my center. I believe this constant refinement is an ongoing practice. Thank you so much, Baba, for your inspiring words. They contain the energy to support me, day by day, in every step towards true freedom. I started to read Baba's teachings, savoring every word. I focused on my breath, and the words penetrated deep within, permeating my entire being. While contemplating them, I noticed the sound of the words vibrating everywhere! I am grateful to Baba for this precious teaching. I plan to implement Baba’s teaching by thinking of my Guru, meditating, and repeating the mantra. When I read Baba Muktananda's teachings, I gain a clear perspective. This teaching directly relates my every action and thought, and every association in my life, to the attainment of the highest goal. Baba’s teachings, coming from his own experience and state, provide an unerring compass for me to live by. Baba's words fill me with hope and encouragement. If I want to have the darshan of the Blue Pearl, I know what I have to do—and, through the Siddha Yoga practices, Baba and Gurumayi have given me the means to do it. Thank you, Baba, for your life and example, and for your constant guidance and presence in my life and sadhana. Thank you from my ever-opening heart.